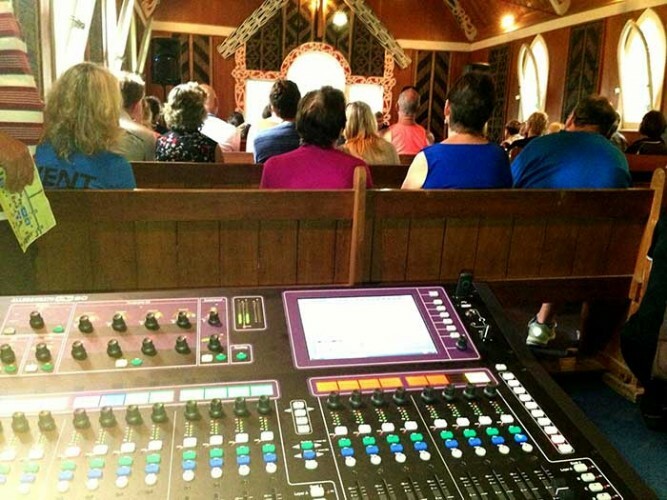 New Zealand - An Allen & Heath GLD-80 digital mixer was recently employed at the National Jazz Festival held in Tauranga, New Zealand. The annual event has included a line-up of New Zealand and international jazz musicians such as The Blind Boys of Alabama and Earth, Wind and Fire to local favourites, Kokomo and Bay Dixie performing in various venues in Tauranga’s historic Jazz Village, a re-creation of New Orleans’ French Quarter. The GLD was installed in the Layfayette Church, one of the Jazz Village’s boutique venues. "I'm mostly a studio guy these days but I can honestly say the GLD's sound quality rivals some of the gear we rely on in the studio. I kid you not I had a Shure SM58 Beta sounding more like a boutique Large Diaphragm Condensor! The vocal was husky, sweet and intimate sounding when fed through the built in Mic Pre, EQ, Compressor and Reverbs. It sounded that good it felt like I was mixing in my comfy chair at the studio, and it was so easy to dial in the sound I wanted. I have to especially give kudos to the compressor and the reverbs - they are fantastic!" explains engineer, Damian Lunson.